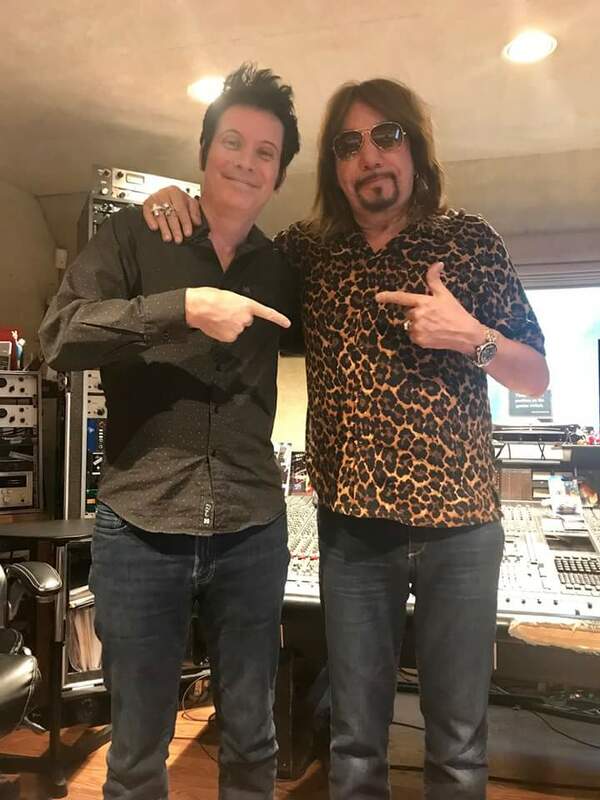 Le nouvel album studio d'Ace Frehley devrait sortir fin avril !!!!!!!! "Ace in Palm Springs getting a tan and a little R & R! The new studio CD will be out the end of April. Rock On!!! – avec RobinHood Pub, Maribdl Aguirre et Mishelle Frehley Strutter." Là, il y a du cliché Rock n' roll !!! Enfin si cela se confirme ; c'est une excellente nouvelle !!! Cela dit, ca sent pas un peu le photoshop sur ses jambes?? ce Did Record With Kiss For the Killers and/or Creatures Albums, Maybe. In the 2003 official Kiss book Behind the Mask, Michael James Jackson is quoted as saying Ace was not on the Creatures of the Night record. In the same book, Vinnie Vincent talks about meeting Ace at this time. Could this meeting have taken place in the studio while they were recording Creatures? Ace Frehley, of course, went on to appear on the album cover, in the promotional music video for the track “I Love It Loud” and also did some press for the record. Around this time Ace claims that Kiss was encouraging him to go and do solo records but also to stay on as a member of the band. Why has Michael James Jackson’s recollection of Ace’s involvement with Kiss at this time in history changed? Again, in the 2003 book, he says Ace was not on the Creatures record and now in 2018 he claims he did record guitar sessions with him for either Killers or Creatures. Could his account had been altered for the “official” Kiss book in 2003 or is he now remembering things differently? Thoughts? Let us known in the comment section below. Vinnie Vincent: I met Ace once and he seemed like a really nice guy. We got on very well. It was a very short conversation. I don’t think I’ve ever run into Ace again. I think I met him when I first joined the band. He wished me luck and said,”Have fun, good luck” And that’s about it. Le producteur de Kiss de l'époque Michael James Jackson est revenu sur ce qu'il avait dit pour le livre "Kiss behind the mask" publié en 2003 lors d'une interview en 2018. Apparemment, Ace aurait joué sur l'un et/ou l'autre de ces albums. En fait, il se rappelle qu'il a joué mais il ne se rappelle plus sur lequel. Sa contribution serait uniquement de la guitare rythmique sur ce ou ces albums. Dommage qu'il n'y ait pas de certitude et que l'on ne puisse pas savoir la teneur exacte du travail réalisé ! Who goes to a Gene Simmons event that costs $2,000 to attend? Are they weird rich guys? Are they mega fans? Are they average rockers just looking for some fun? There was only one way to find out. Best-known as the flamboyant co-founder and bassist of classic rock mega-machine Kiss, Gene Simmons is also an unstoppable entrepreneur. He will proudly brand and sell any item, once famously licensing and releasing the Kiss Kasket. 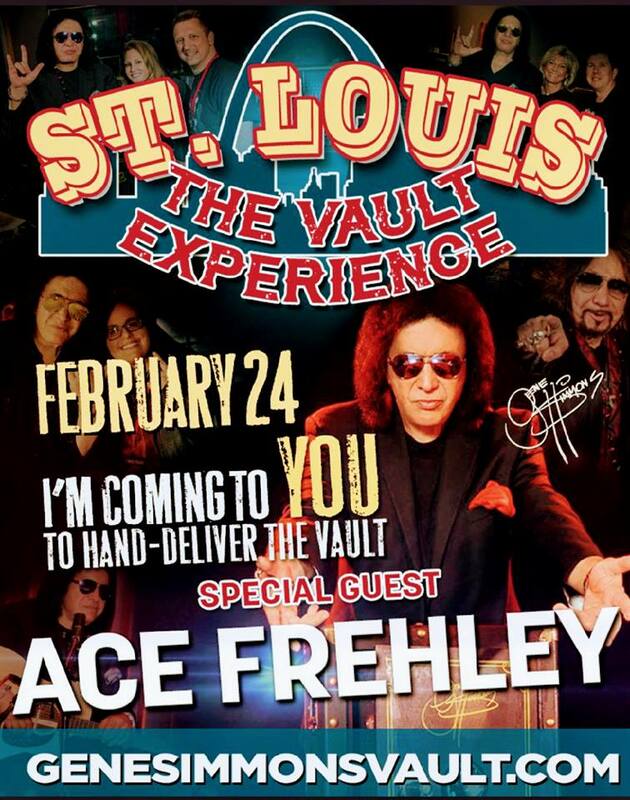 His latest moneymaker is the Gene Simmons Vault Experience. Simmons is selling a mega box set that looks like a combination between a safe and a road case. It weighs 40 pounds and it contains hours of unreleased recordings. It also includes a little Simmons action figure and a massive book, among other things. The event in St. Louis was hosted by Music Record Shop and held in the .ZACK building, where the shop is now located. Instead of taking place at the store, however, the Vault Experience was hosted at the shop's luxury green room/event space, 303. 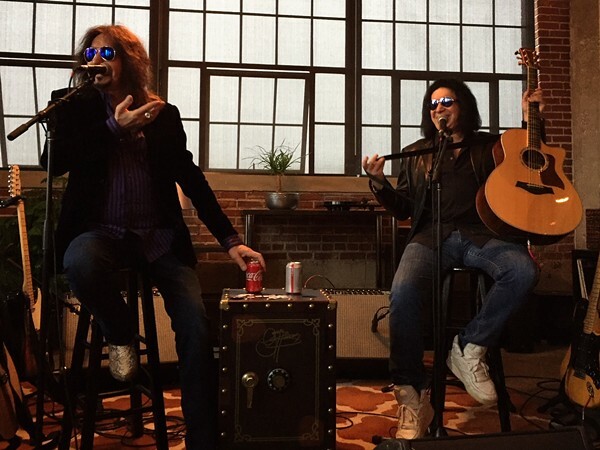 The day would include an extended town hall-style Q&A, a break for some fragrant Pappy’s Smokehouse barbecue and then an acoustic set where Simmons was joined by Ace Frehley. All throughout the day, Simmons served himself up for private meet-and-greets with fans, autographing their Kiss memorabilia. Photo du 09 décembre 2017 : c'est vrai qu'il a quand même bien perdu du poids ! je suis contente pour lui !!!!!! DE PERE, Wis. (WBAY) - Celebrate De Pere has announced two headliners for 2018's celebration at Voyageur Park. 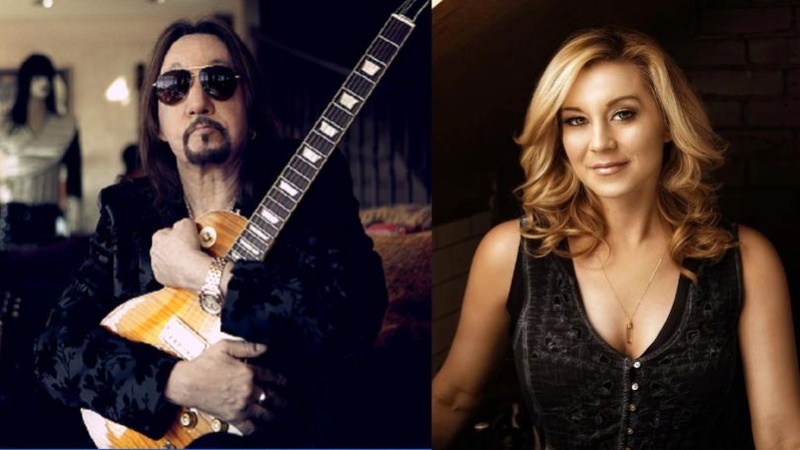 Former KISS guitarist Ace Frehley and country singer Kellie Pickler will take the stage during the weekend billed as "the Official Kick Off to Summer." 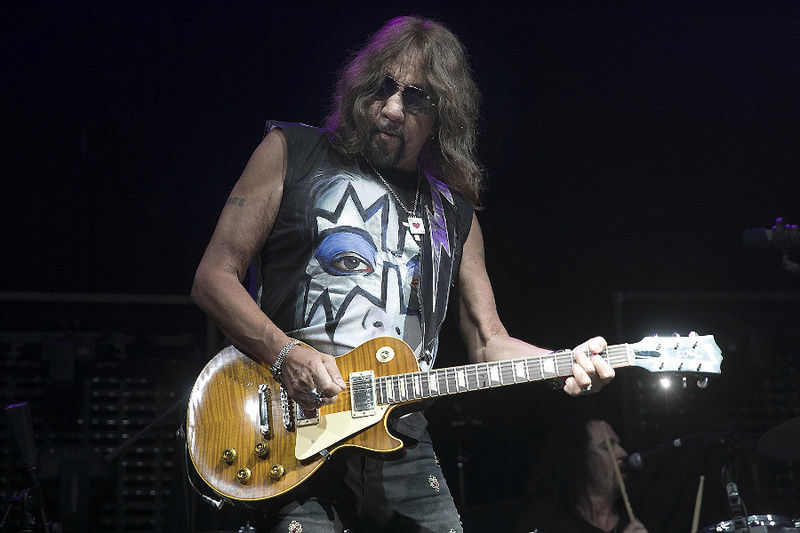 Frehley, known for many years as KISS's Spaceman, left the group in 2000 to focus on his solo career. 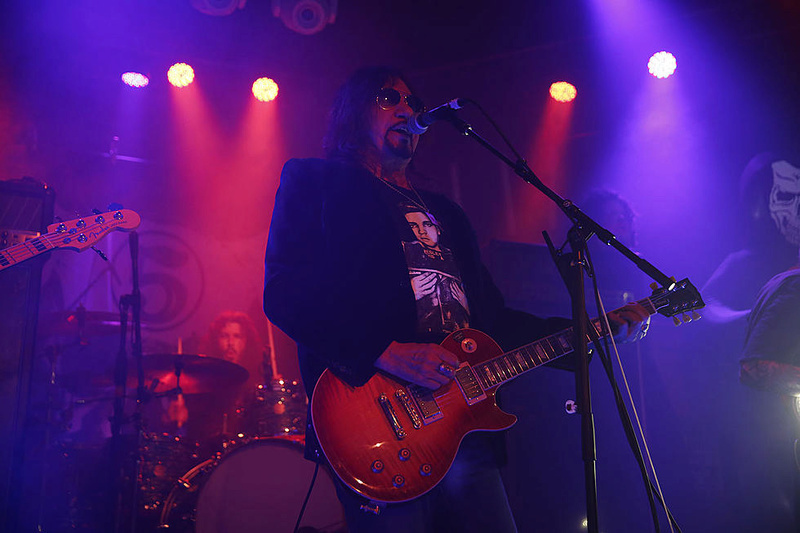 Frehley will be the headliner on Saturday, May 26. Kellie Pickler was on the fifth season of "American Idol" and found success in the world of country music. She also won her season of "Dancing With the Stars." Currently, Pickler co-hosts the talk show "Pickler and Ben." Kellie Pickler will headline on Sunday, May 27. Alice Cooper announced a headlining North American tour behind his 27th studio album, 2017's Paranormal. 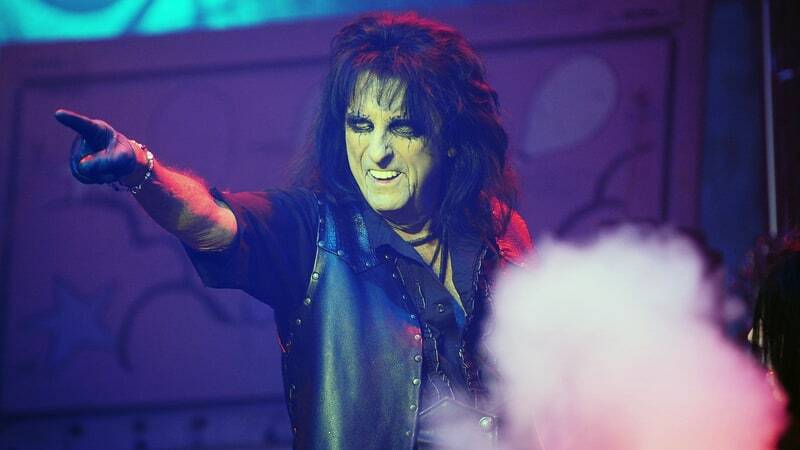 The summer trek, dubbed "A Paranormal Evening With Alice Cooper," launches August 3rd at the Wisconsin State Fair in West Allis, Wisconsin and wraps September 7th at the York Fair in York, Pennsylvania. 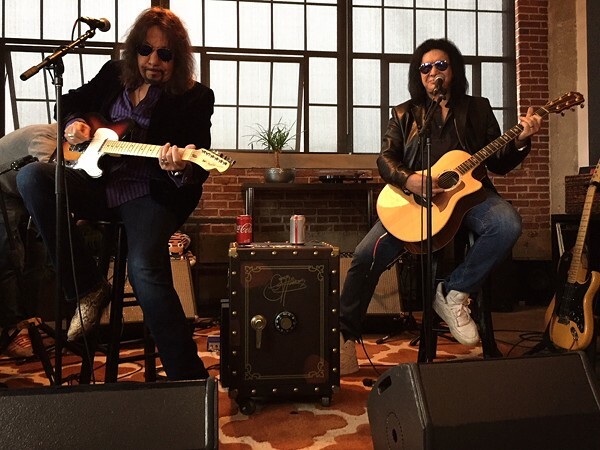 Former Kiss guitarist Ace Frehley will join as a special guest for two shows: August 10th in Las Vegas and August 12th in Los Angeles. Further information including ticket sale dates and VIP package details is available on Cooper's website. ALL PRE-ORDERS INCLUDE A MINIMUM OF 2 FREE EXCLUSIVE Ace Frehley trading cards! 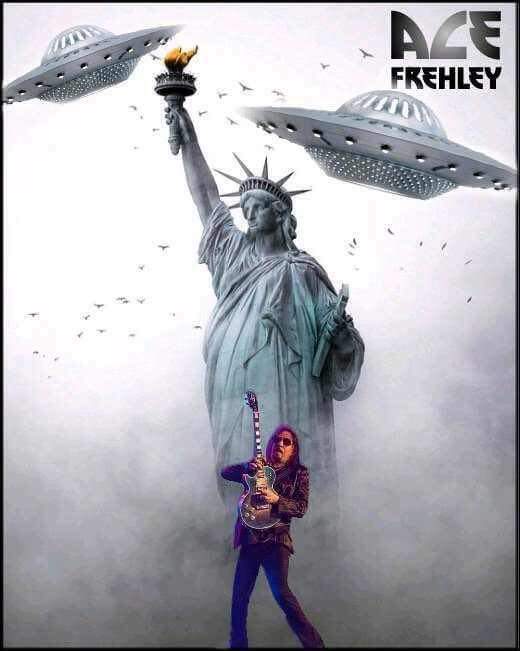 The original Space Invader, ACE FREHLEY, is landing at FANTASM MEDIA! 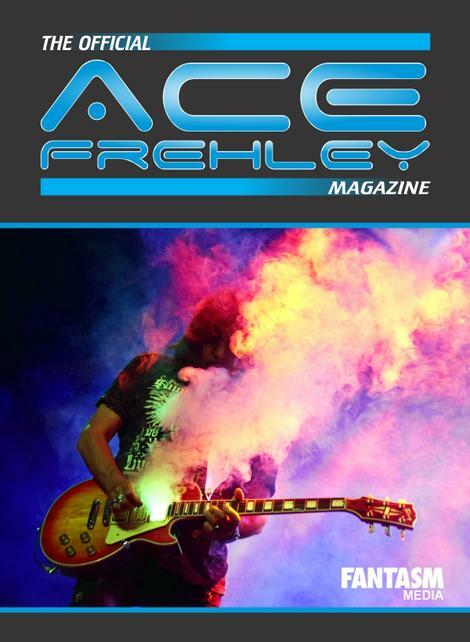 Announcing THE OFFICIAL ACE FREHLEY MAGAZINE from FANTASM MEDIA! We are publishing this magazine in partnership with ACE himself and it is guaranteed to be Shot Full of Rock! This jam-packed issue will leave you Fractured! It features a career-spanning retrospective conversation with ACE himself as well as new band interviews with RICHIE SCARLET, CHRIS WYSE & SCOT COOGAN. Front-to-back it's packed with tons of never-before-seen photos, a complete gear rundown, and more! We also talk to musical superstars who were influenced by the man from Jendell, including JOHN 5, CHARLIE BENANTE and more! You can bet we have an ACE up our sleeve and it will be full of other surprises as well! 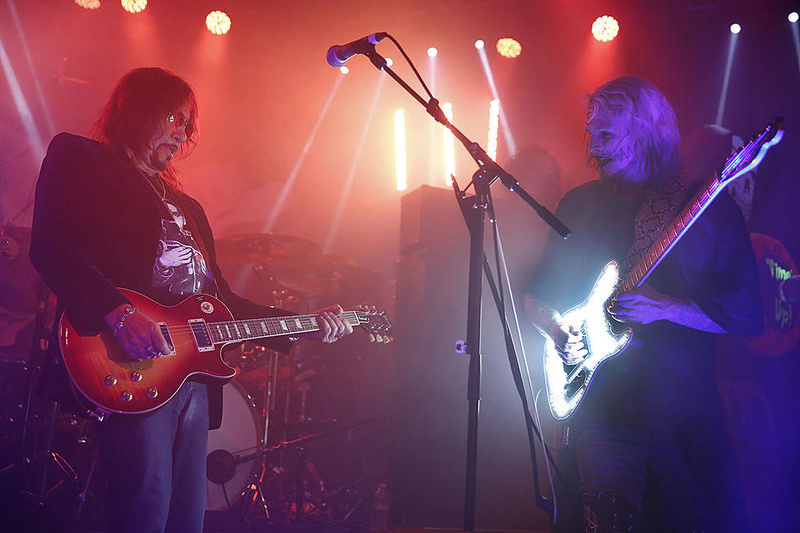 Former MARILYN MANSON and current ROB ZOMBIE guitarist John 5 was joined by Ace Frehley (KISS), Nikki Sixx (MÖTLEY CRÜE), Scott Ian (ANTHRAX) and Scott's wife Pearl Aday (daughter of actor/musician Meat Loaf) during his concert Friday night (April 6) at the Whisky A Go Go in West Hollywood, California. Sixx, Ian and Aday stepped out on stage for the show opener, a cover of the MÖTLEY CRÜE classic "Shout At The Devil", while Frehley came on at the end of the night to play the KISS classics "Parasite" and "Shock Me". Former SKID ROW frontman Sebastian Bach, who was originally supposed to sing "Shout At The Devil" with Sixx, Ian and John 5, did not make an appearance at the event. According to John 5, Bach will now join him on stage on April 11 at Discovery Ventura in Ventura, California. 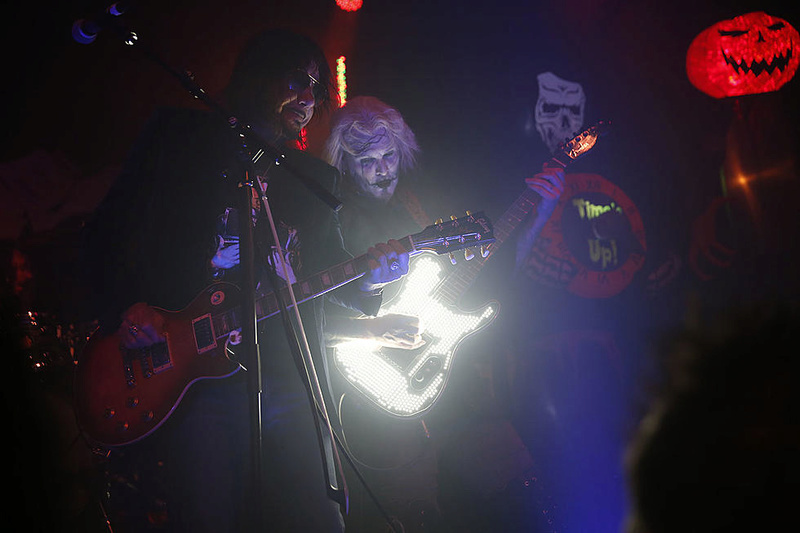 John 5 is touring in support of his concert album, "It's Alive! ", which came out on January 25. The first live album released by John 5 and THE CREATURES — which includes Ian Ross on bass and Logan Miles Nix on drums — is also the first LP released by John 5 to be made available on vinyl. Paul Daniel "Ace" Frehley nasce nel a New York (Bronx) il 27 aprile 1951 ed è un chitarrista statunitense noto soprattutto come chitarrista del gruppo rock dei Kiss, in cui usava il nome d'arte Ace Frehley - The Spaceman. Il soprannome "Ace" ("asso") è un riferimento alla sua abilità con le donne. Ace Frehley nasce il 27 aprile del 1951 nel Bronx, New York da una famiglia umile. I componenti della sua famiglia sono tutti musicisti (il padre suona l'organo in una chiesa, la madre e la sorella il pianoforte e il fratello suona la chitarra alle feste matrimoniali). Frehley all'inizio non venne toccato dalla musica e cresce frequentando le gangs di strada (nella sua stessa banda c'era anche Blackie Lawless, futuro leader dei W.A.S.P.). A 13 anni, i genitori gli donarono una chitarra, cercando in tutti i modi di toglierlo dalla delinquenza. Frehley continua la vita da adolescente ribelle, anche se inizia a distaccarsi dalle gangs di strada, dopo essere rimasto vittima di una rissa e dopo che gli venne fratturato il cranio con una bottiglia di vetro. Avvicinandosi ai 20 anni, abbandona definitivamente quello stile di vita ed inizia a suonare seriamente il suo strumento (ringrazierà sempre la musica per aver contribuito ad allontanarlo dalla vita di strada) ascoltando chitarristi come Eric Clapton, Pete Townshend, Jeff Beck e Jimmy Page. Preso il diploma, Ace inizia a fare lavoretti per raggranellare i soldi necessari all'acquisto della strumentazione e suona in band minori come "Magic People", "The Muff Divers" e "Four Roses", migliorando in tecnica e in esperienza. Verso la fine del 1972 Frehley lesse un annuncio su un giornale riguardante un gruppo che cercava un chitarrista solista ed Ace si presentò all'audizione. 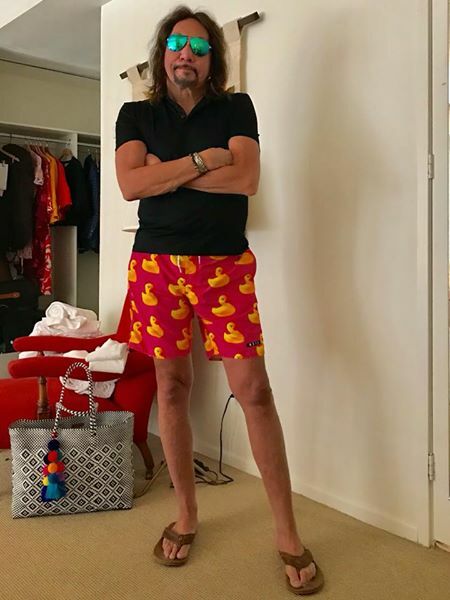 Paul Stanley, leader di questo gruppo, accettò Frehley non solo per la sua bravura ma anche per la sua stravaganza (la leggenda narra che si presentò con una scarpa arancione ed una rossa), una caratteristica a cui Stanley teneva molto. Nacque così una band che entrerà a far parte della storia della musica, i Kiss. La formazione, ora completa, comprendeva Paul Stanley alla voce e chitarra, Gene Simmons alla voce e basso, Peter Criss alla batteria e Ace Frehley alla chitarra solista; con questa formazione venne realizzato il primo album omonimo Kiss (1974). Sulla copertina dell'album e durante le loro esibizioni, i Kiss si presentavano con il volto truccato ed indossando dei costumi. Il personaggio impersonato da Ace Frehley era l'uomo dello spazio (SpaceMan), con il trucco facciale costituito da stelle argentate bordate di nero. 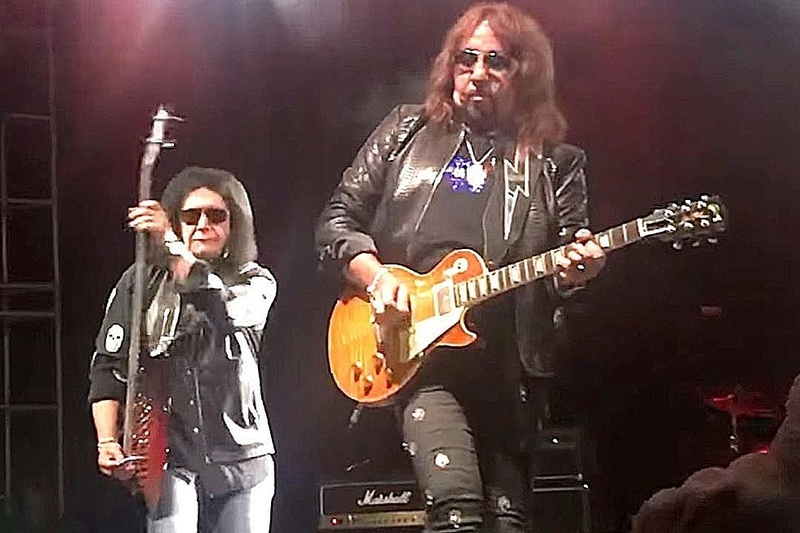 Oltre al trucco e al costume, Frehley aggiunse alla sua Gibson Les Paul alcuni effetti speciali costituiti da un fumogeno al posto del pick-up e dei razzi posti nella paletta della chitarra, collegandoli ai componenti elettrici dei volumi e dei toni. Il genere suonato era il glam rock, genere basato sull'immagine e sullo spettacolo di cui i Kiss, assieme a New York Dolls, Alice Cooper e Slade, furono fra i rappresentanti più illustri. Cold Gin, brano del disco scritto da Ace, diventerà uno dei cavalli di battaglia dei Kiss e sarà oggetto di cover da parte di tantissimi gruppi. I Kiss entreranno nella storia del rock grazie a dischi di valore come il disco dal vivo Alive! (definito dalla critica uno dei migliori live della storia), Dressed to Kill (1975) e Destroyer (1976). Ma il successo del quartetto portò eccessi e diverbi che portarono i Kiss verso l'instabilità. Nel 1982 Ace Frehley, dopo un'accesa discussione con i due membri fondatori Stanley e Simmons, lascia improvvisamente il gruppo. Alcuni dei motivi furono il disaccordo musicale (Ace non apprezzò le svolte di Dynasty, Unmasked e Music from "The Elder") e il poco spazio compositivo che i due membri fondatori lasciavano al chitarrista durante la produzione dei brani. Inoltre poco prima del previsto tour di "The Elder", che non fu mai effettuato, Ace ebbe un grave incidente automobilistico con la sua DeLorean, da cui poi il brano Rock Soldiers con i Frehley's Comet. Tuttavia, negli album successivi, ovvero Killers e Creatures of the Night, Frehley continuò ad apparire nella copertina e ad essere indicato nei crediti come chitarrista solista, pur non avendo mai partecipato neanche alla composizione dei brani anche se compare nei video. 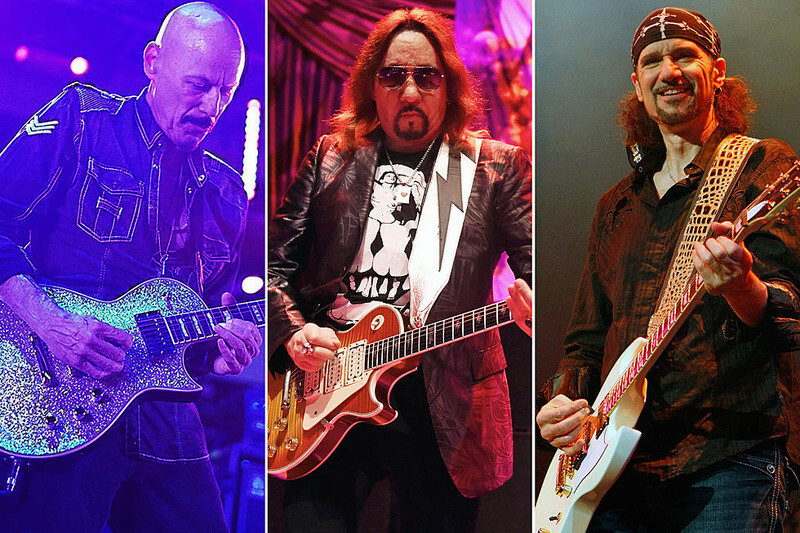 Nelle registrazioni degli album fu sostituito da Bob Kulick, Adam Mitchell, Steve Farris e Vinnie Vincent, che prenderà ufficialmente, a partire dal dicembre del 1982, il posto di Frehley. Nel 1996 è rientrato insieme a Peter Criss a far parte dei Kiss e tutti insieme (Paul, Gene, Ace e Peter) hanno prodotto l'album Psycho Circus (1998) dal quale successivamente nel 2000 uscì il gioco omonimo. Successivamente nel 1999 tutti e 4 i componenti originali hanno realizzato il film "Detroit rock city" per poi risepararsi per far entrare nella band i 2 nuovi componenti: Eric Singer al posto di Peter Criss e Tommy Thayer al posto di Ace Frehley. Dopo aver lasciato i Kiss, Ace fonda la propria band: i Frehley's Comet e pubblica il primo album omonimo della formazione nel 1987. Il chitarrista viene accompagnato dal batterista Anton Fig (che suonò anche con i Kiss in Dynasty, Unmasked per sostituire Peter Criss e nell'album solista di Ace durante il periodo del suo ex gruppo), dal cantante/chitarrista Tod Howarth e dal bassista John Regan. Il genere è un glam metal molto vicino ai Kiss ma con un suono più moderno e robusto. Nel 1988 esce il mini-album dal vivo intitolato Live + 1 e il successivo disco in studio Second Sighting dove il posto di batterista viene preso, temporaneamente, da Jamie Oldaker. Mentre Anton Fig torna, il cantante Howarth se ne va e il gruppo incide un nuovo album a nome di Ace Frehley chiamato Trouble Walkin (1989). Alla voce c'è lo stesso Frehley e vengono chiamati vari ospiti come Sebastian Bach, Dave Sabo e Peter Criss, dopodiché il gruppo si scioglierà. Arriva una notizia positiva per i fan dei Kiss. Dopo un bel po' di anni di assenza dal mondo della musica, Ace torna con i compagni di un tempo, prendendo il posto di Bruce Kulick (chitarrista solista dei Kiss per circa un decennio) e incidono il disco live acustico Kiss Unplugged (1996). Nel gruppo torna anche Peter Criss e la formazione originale incide: Psycho Circus (1998) dove Frehley canta in due brani: Into the Void e In Your Face (brano contenuto nella versione giapponese del disco). Nel 2000 i Kiss intraprendono il tour di addio: The Farewell Tour e successivamente la band si dichiarò definitivamente sciolta[senza fonte]. Nel 2002 i Kiss si riuniscono e oltre ai membri originali Stanley e Simmons si aggregano il nuovo chitarrista Tommy Thayer e il batterista Eric Singer (che già suonò con loro in Revenge, Alive III e Carnival of Souls) con questa nuova line up, a sorpresa, i Kiss pubblicano nel 2009 il nuovo album Sonic Boom. Intanto, Ace si dà a una piccola parentesi cinematografica e recita in un film chiamato Remedy (2005) e torna alla sua carriera solista pubblicando nel 2009 il suo quinto album, intitolato Anomaly. Nel 2006 ha partecipato ai Rock Honors, suonando la canzone dei Kiss (God of Thunder) insieme a Slash, Rob Zombie, Tommy Lee, Gilby Clarke e Scott Ian. Durante la tournée del 1977 in Giappone, mentre erano in albergo, Frehley, in stato di ubriachezza, si presentò con una divisa nazista mostrando il saluto romano. Ciò non poté che sucitare l'ira di Gene Simmons, dato che quest'ultimo proveniva (come per Paul Stanley) da una famiglia ebrea e che sua madre scampò per miracolo all'olocausto. Ripresosi dalla sbornia, Ace dovette chiedere scusa a Simmons per l'accaduto. 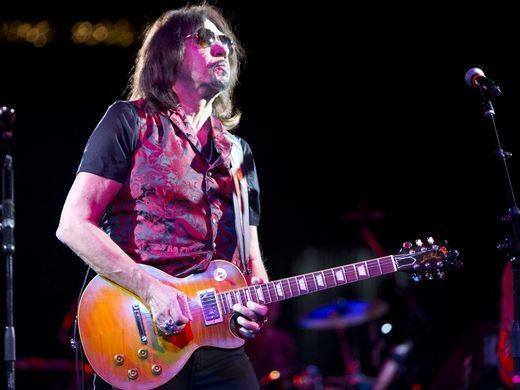 Paul Daniel "Ace" Frehley est né à New York (Bronx) le 27 avril 1951 et est un guitariste américain connu principalement comme le guitariste du groupe rock Kiss, dans lequel il a utilisé le nom de scène Ace Frehley - The Spaceman. A 13 ans, ses parents lui ont présenté une guitare en regardant tous les moyens de le retirer de la délinquance. Frehley encore la vie d'adolescente rebelle, même si elle commence à se détacher des gangs de rue, après avoir été victime d'un combat et après qui a été fracture du crâne avec une bouteille en verre. En approchant 20 ans, il a définitivement abandonné ce style de vie et a commencé à jouer sérieusement son instrument (encore une fois remercier la musique pour aider à se déplacer loin de la vie de la rue) en écoutant des guitaristes comme Eric Clapton, Pete Townshend, Jeff Beck et Jimmy Page. Après avoir été diplômé, Ace a commencé à faire des corvées pour réunir l'argent nécessaire à l'achat de l'instrumentation et a joué dans des groupes mineurs tels que "Magic People", "The Muff Divers" et "Four Roses". Vers la fin de 1972, Frehley a lu une annonce dans un journal sur un groupe qui cherchait un guitariste solo et Ace s'est présenté à l'audition. 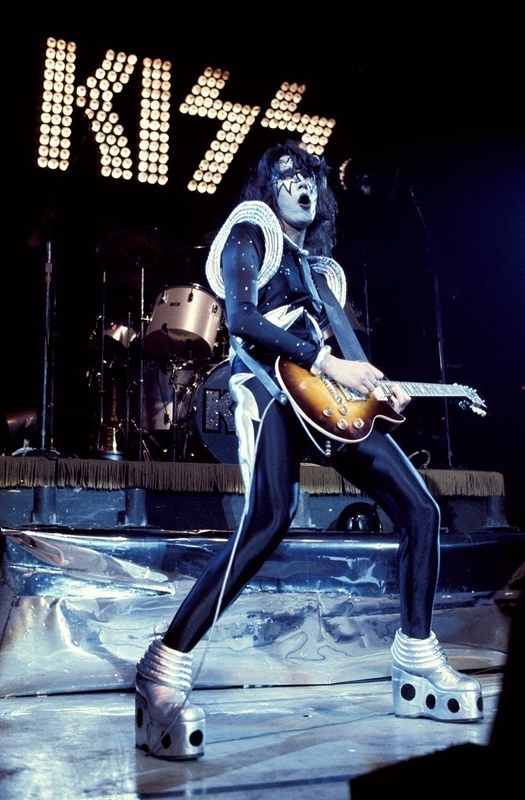 Paul Stanley, leader de ce groupe, a accepté Frehley non seulement pour son talent mais aussi pour son extravagance (la légende raconte qu'il s'est présenté avec une chaussure orange et une chaussure rouge), une caractéristique dont Stanley se souciait beaucoup. 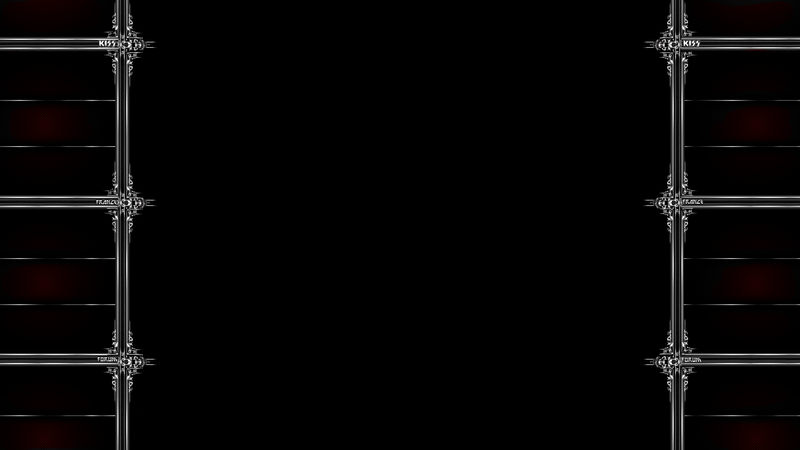 C'est ainsi qu'est né un groupe qui va faire partie de l'histoire de la musique, Kiss. La formation, maintenant complète, comprenait Paul Stanley au chant et à la guitare, Gene Simmons au chant et à la basse, Peter Criss à la batterie et Ace Frehley à la guitare principale; Avec cette formation a été créé le premier album homonyme Kiss (1974). 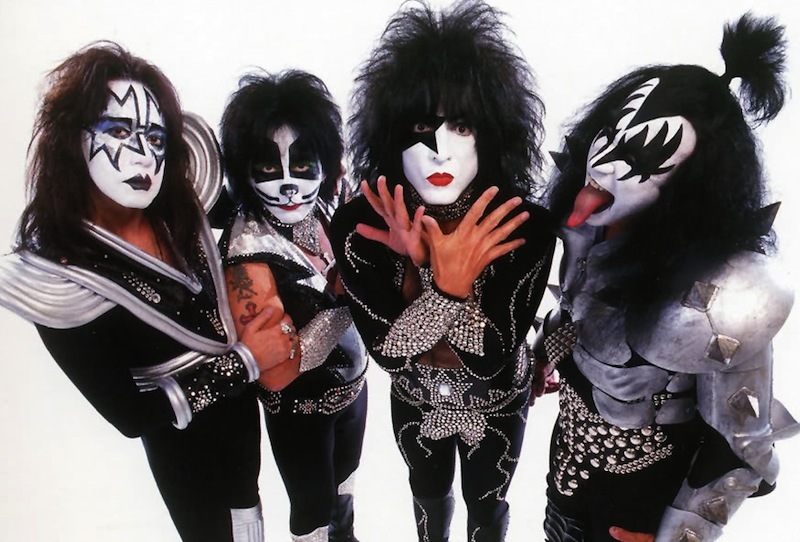 Sur la couverture de l'album et lors de leurs performances, le Kiss s'est présenté avec des maquillages et des costumes. Le personnage joué par Ace Frehley était l'homme de l'espace (SpaceMan), avec le maquillage du visage composé d'étoiles d'argent bordées de noir. 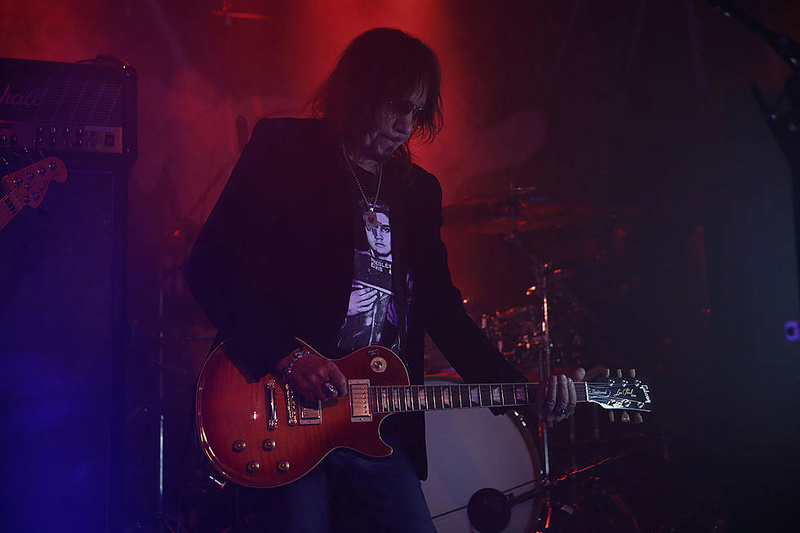 En plus de maquillage et costume, Frehley ajouté à sa Gibson Les Paul des effets spéciaux se composent d'une bombe fumigène à la place du pick-up et placé des fusées au manche de la guitare, en les reliant aux composants électriques de volume et de tonalité. Le genre joué était le glam rock, genre basé sur l'image et le spectacle dont Kiss, avec New York Dolls, Alice Cooper et Slade, étaient parmi les représentants les plus éminents. Cold Gin, un morceau du disque écrit par Ace, deviendra l'un des cheval de bataille du Kiss et fera l'objet d'une reprise par de nombreux groupes. Kiss entrera dans l'histoire du rock grâce à des disques précieux tels que l'album live Alive! (Qualifié par les critiques comme l'un des meilleurs live de l'histoire), Dressed to Kill (1975) et Destroyer (1976). Mais le succès du quatuor a provoqué des excès et des craintes qui ont amené Kiss à l'instabilité. En 1982, Ace Frehley, après une discussion animée avec les deux membres fondateurs Stanley et Simmons, a soudainement quitté le groupe. Certaines des raisons étaient le désaccord musical (Ace n'a pas apprécié les tours de Dynasty, Unmasked et Music from "The Elder") et le petit espace de composition que les deux membres fondateurs ont laissé au guitariste pendant la production de ces albums. Aussi peu avant la tournée prévue de "The Elder", qui n'a jamais été jouée, Ace a eu un grave accident de voiture avec son DeLorean, d'où la chanson Rock Soldiers avec Frehley’s Comet. Cependant, dans les albums suivants, ou Killers et Creatures of the Night, Frehley a continué à apparaître sur la pochette et à être montré dans le générique en tant que guitariste solo, bien qu'il n'ait jamais participé à la composition des chansons même si elle apparaît dans les vidéos. Dans les enregistrements des albums il a été remplacé par Bob Kulick, Adam Mitchell, Steve Farris et Vinnie Vincent, qui prendra officiellement la place de Frehley en décembre 1982. En 1996, il revient avec Peter Criss pour faire partie du Kiss Réunion (Paul, Gene, Ace et Peter) produit l'album Psycho Circus (1998) dont sortira ensuite le jeu du même nom en 2000. Puis, en 1999, les 4 originaux ont tourné le film "Detroit rock city" et se sont séparés pour intégrer 2 nouveaux membres dans le groupe: Eric Singer au lieu de Peter Criss et Tommy Thayer à la place d'Ace Frehley. Après avoir quitté Kiss, Ace a fondé son propre groupe: Frehley's Comet et a sorti le premier album éponyme du groupe en 1987. Le guitariste est accompagné du batteur Anton Fig (qui a également joué avec Kiss sur Dynasty et Unmasked pour remplacer Peter Criss et dans l'album solo d'Ace durant la période avec son ancien groupe), le chanteur / guitariste Tod Howarth et le bassiste John Regan. Le genre est un glam metal très proche de Kiss mais avec un son plus moderne et plus robuste. En 1988, il a sorti le mini-album intitulé Live + 1 suivi de l’album Second Sighting où le batteur a été Jamie Oldaker. Alors qu'Anton Fig revient, le chanteur Howarth part et le groupe enregistre un nouvel album intitulé Ace Frehley, Trouble Walkin (1989). 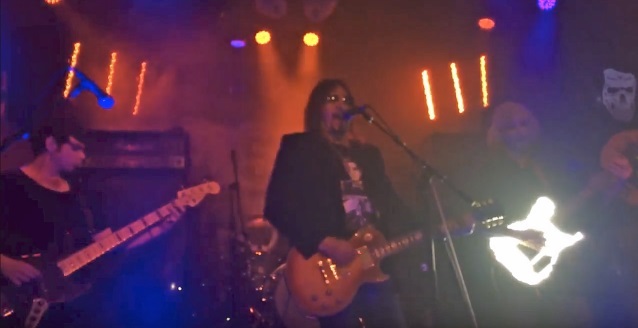 Le chant est assuré par Frehley lui-même et divers invités sont appelés tels que Sebastian Bach, Dave Sabo et Peter Criss, après quoi le groupe se dissoudra. Il y a des nouvelles positives pour les fans de Kiss. Après beaucoup « d'années d'absence du monde de la musique, Ace revient avec d'anciens camarades, prenant le relais de Bruce Kulick (guitariste principal de KISS depuis une décennie) et enregistré leur album live acoustique Kiss Unplugged (1996) . Le groupe a également dos Peter Criss et la programmation originale enregistrée: Psycho Circus (1998) où Frehley chante sur deux pistes: Into the Void et In Your Face (fichier dans la version japonaise de l'album). En 2000, Kiss se lance dans la tournée d'adieu: The Farewell Tour et plus tard le groupe se déclare définitivement dissous [sans source]. En 2002, Kiss se rassemblent et en plus des membres originaux Stanley et Simmons ensemble nouveau guitariste Tommy Thayer et le batteur Eric Singer (qui a déjà joué avec eux dans La Revanche Alive III et Carnival of Souls) avec cette nouvelle gamme, la surprise , Kiss a sorti le nouvel album Sonic Boom en 2009. Pendant ce temps, Ace participe au film intitulé Remedy (2005) et revient à sa carrière solo en publiant en 2009 son cinquième album, intitulé Anomaly. En 2006, il a participé aux Rock Honors, jouant la chanson de Kiss (God of Thunder) avec Slash, Rob Zombie, Tommy Lee, Gilby Clarke et Scott Ian. Pendant la tournée de 1977 au Japon, alors que dans l'hôtel, Frehley, dans un état d'ivresse, s'est présenté avec un uniforme nazi montrant le salut romain. Cela ne pouvait que susciter la colère de Gene Simmons, puisque ce dernier est venu (comme Paul Stanley) d'une famille juive et que sa mère a miraculeusement échappé à l'Holocauste. Récupéré de la gueule de bois, Ace a dû présenter des excuses à Simmons pour l'incident. "Je suis une anomalie, je n'ai pas d'études. Je ne sais même pas comment lire une partition, mais je suis l'un des guitaristes les plus célèbres au monde », a déclaré le New Yorker en 2009 au Rock N Roll Magazine. Membre fondateur du groupe dirigé par Gene Simmons, Frehley a fait l'histoire de KISS en deux périodes entre 1973 et 1982 et 1996 à 2002, dans lesquelles il a assumé le rôle de Spaceman avec la composition emblématique de ses membres. Paul Daniel Frehley, mejor conocido como 'Ace Frehley', 'Space Ace' o 'Spaceman', está de festejo, pues este 27 de abril cumple 67 años de edad. Frehley fue guitarrista y miembro original de KISS. Nació en el Bronx, Nueva York en 1951, siendo el menor de tres hermanos. Debido a que sus padres eran pianistas, él y sus hermanos se interesaron desde pequeños en la música, aprendiendo a tocar dicho instrumento y la guitarra acústica. Durante su adolescencia fue parte de varias bandas hasta que en 1973 fue aceptado en la recién fundada KISS. Fue parte de la banda hasta 1983, a pesar de que no participó en el disco 'Creatures of the Night', Kiss lo incluyó en los créditos. Tras su salida de la agrupación, Ace, se enfocó en su nueva banda 'Frehley's Commet' con la cual grabó tres álbumes. También ha grabado cuatro discos en solitario. De 1996 a 2002 se volvió a reunir con los miembros originales y durante este tiempo fue parte de dos giras y la grabación de un disco. A lo largo de su carrera 'Space Ace' ha demostrado su amor por la música, ya sea en solitario o con KISS, siempre ha sabido brillar. ¡Celebremos el cumpleaños número 67 del gran Ace Frehley! 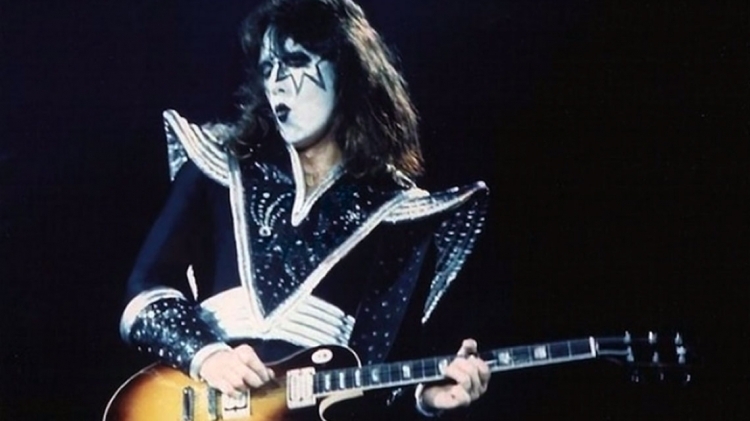 Célébrons le 67ème anniversaire du grand Ace Frehley!